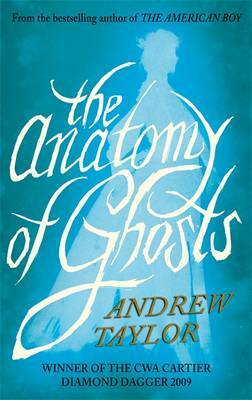 THE ANATOMY OF GHOSTS is the newest novel for established author Andrew Taylor and was short-listed for the CWA Ellis Peters Historical Dagger. This totally absorbing, book is set in Jerusalem College, Cambridge, in 1786 and is guaranteed to have you staying up late to find out what happens next. The hero of the book is the recently widowed, former bookseller, John Holdsworth. After the death of their young son, his wife becomes obsessed with consulting spiritualists and mediums, who claim that Georgie is well and wishes his parents health and happiness. Outraged at the way in which his wife's vulnerability is being preyed upon, John writes a controversial book, exposing ghosts as being nothing more than the imaginings of the uneducated. Stricken with grief and unable to come to terms with her loss, Maria Holdsworth ends her own life, leaving John alone, destitute and haunted by his dreams. Things take a dramatic turn for the better when John is requested to pay a visit to Lady Ann Oldershaw. She commissions him to catalogue her late husband's library, before it is bequeathed to Jerusalem College, and also to visit the college on her behalf regarding a rather delicate matter: her son, Frank, has recently been taken unwell and admitted to a mental institution suffering from 'nervous exhaustion', apparently after having seen a ghost - the former Mrs Whichcote, who has recently drowned in a pond in tragic and mysterious circumstances. Lady Ann wishes for John to get to the bottom of the ghost story and disprove it, so that her son may recover from his shock and have his wits returned. Despite some serious misgivings, John travels to Cambridge and sets about solving the mystery. It is here that he meets a young woman - the wife of Jerusalem's Master - who sets his emotions ablaze, despite the fact that she is married and his dreams are still disturbed by his dead family. John is extremely thorough in his investigations and soon has certain individuals at Jerusalem feeling rather uncomfortable. This book is simply wonderful. It is well written and brimming with the delightful way in which 'genteel society' spoke to each other in the 1700s. It is captivating reading, right from the very first page, and is full of intriguing characters. Despite his lack of resources, John Holdsworth himself is a bit of a 'Mr. Darcy' figure and is such an honest man that you really sympathise with him for his losses. It is wonderful to see him starting to smile again as the plot unfolds. If you like historical crime fiction, with a hint of the supernatural and a twist to surprise you when you think that you've worked everything out, then THE ANATOMY OF GHOSTS is the perfect book for you. Personally, I loved it!